This past Sunday on a cold windy morning I ran my first race that I trained for in almost 17 years. The days leading up to the race were sort of anti climatic as I had been working and training hard for the previous three months that it was hard to believe the race was finally here. Though I will say that as always the case before a big race/competition I did experience anxiety, something I’ve had my whole life. Preparation for the race began the day prior. I started to think about the race and what my goal time would be. Initially when I signed up for the race I thought that I could do it under 2 hours. When I ran the course two weeks ago I ran it in 1:57 at an easy pace. I thought about setting a goal time of going under 1:50 but when I realized I would have to average 8:20 per mile I didn’t think it was possible. Eventually I settled on anywhere between 1:50 and 1:55 I would be happy with. In the afternoon I set out my cold weather gear as it was going to be in the high 30’s with a wind chill around freezing. I set out my energy goos, Ben Gay for my calf’s and the sneakers I’d ride for 13.1 miles. I made sure to go to bed early as with a 7:00 start time I wanted to get up at 4:15 to have enough time to eat breakfast and for it to settle before the race. Surprisingly I had no trouble sleeping the night before giving me the sleep I needed for the race. At 4:15 the day of the race I woke up had my breakfast which consisted of an English Muffin with Peanut Butter, a banana and some glasses of water. I left my house at 5:45 to get to the race by 6. Surprisingly the hour before the race went by fast. When I got to the start line I lined up in the back of the 8 minute mile group and located the 1:55 pace runner (these runners who wore tags and carried sticks with the times they would pace themselves to run) who I would try to stay with. At exactly 7:00 the start horn went off as I hit the start timer on my GPS watch that I would also use to pace myself. The first two miles were around 8:12-8:20, which were faster than I had wanted to run to start the race. I knew I had to take it back a notch if I wanted to have enough left in the tank for the rest of the race. It was towards the end of mile 3 when I first realized that I felt good and could pick up the pace. Little did realize that third mile that I thought I was taking it slower I would run it in under 7:50. By mile 4 I was in a groove. It was then that I realized what I was doing and remembered how much I loved running races. Not once throughout the race did I even think about my infertility or anything else that K & I went through in the last two years. For that race my running was the only thing that mattered. In the middle of mile five realizing that my last two miles were under 8 minutes I started to think that maybe I could hit under 1:50. It was then that I took my first of two energy goos preparing for the first of two parts of the course that were up hill. About mid way up that first hill the wind gusts would start to pick up. Despite the hill and wind that mile was barely over 8 minutes. In the back of my mind I was afraid that K and my in laws wouldn’t be at the finish line because they weren’t expecting me until 1:50-1:55 to finish the race. It wouldn’t have been the same if she wasn’t there. It was in the middle of mile 7 when I came up on the 1:45 pace runner. That was the moment when I knew that not only was running under 1:50 realistic but maybe hitting around 1:45 could happen. I kept pushing as I approached the second hill part of the course. Despite not being as steep as the first part this hill would last the next 1.5-2 miles. Two weeks prior it has hit me hard and I prepared that it would hit me hard again. In the middle of that hill 9.5 miles in I took my last energy goo to give me my last boost to finish the race. As I approached the top of the hill at mile 10 I started to hit a wall. I thought about stopping and not because my calf was tight or my Achilles was sore but because I doubted whether I had enough left. But looking over and seeing the 1:45 pace runner kept me going. All I had was a 5K left, just 3 miles. Getting through that mile was tough but when I did I knew with 2 miles left and almost 1:30 in that barring me collapsing that I was going to finish under 1:50 with an outside shot at finishing under 1:45. The last mile I wanted to really push it. Despite literally running on fumes I pushed it as hard as I could heading into the final turn towards the finish line. As I approached the finish line I started to look to see if I saw K & my in laws as I was worried they would miss me. But sure enough right by the finish line I saw them. I smiled at K knowing how well I was about to finish. She has been amazing in her support of me and I couldn’t have done this w/out her. The last 100 meters I went into a hard kick as I saw the race clock approaching 1:45. 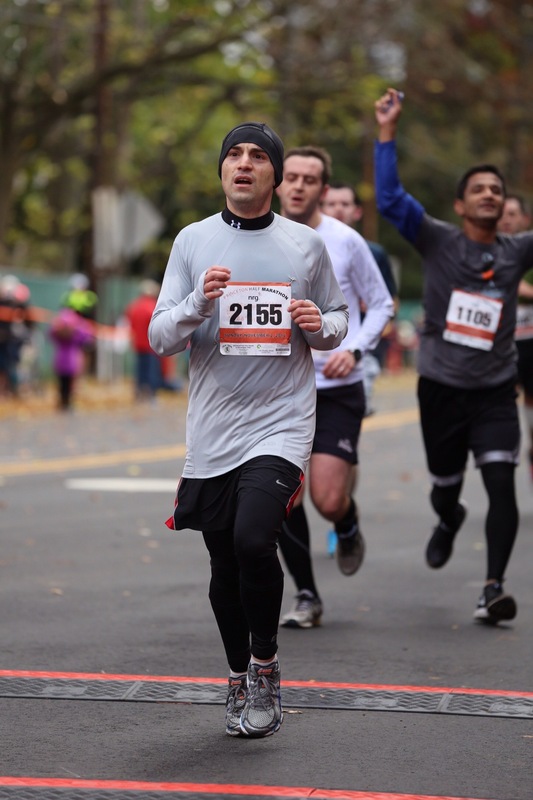 Crossing the finish line at 1:44.59 (below is the picture of me crossing the finish line), I realized that I just did something that the day prior I would have thought would be impossible for me to accomplish. I had just run a half marathon in under 1:45 averaging 8 minute miles something I had not done for any of my long runs in training even the long runs that were half that distance. Adding in the cold and wind it was amazing that I did it. A few minutes after crossing the finish line I caught up with K & my in laws. Apparently my father in law thought that I would finish in 1:45 despite K telling him that I told her I’d likely finish 1:50-1:55. I was in a state of euphoric tiredness that is hard to describe. Eventually I started to feel the tightness and soreness in my lower body as an indication of how hard I pushed my body. Make no mistake about it that race was hard. Training for the race was hard. Though I had began seriously running in early July, I had begun getting back into serious shape in mid January. Basically all of 2014 I had been preparing for this. Though when I began to get back into shape I didn’t think I would be signing up to run a half marathon in November. Heck if I knew the end result of getting back into shape would have been me signing up to run a 5K Turkey Trot on Thanksgiving in a decent time I would have been thrilled. Never ever did I think I would even entertain the idea of running a half marathon let alone finishing one in under 1:45. Five days later I still can’t believe what I accomplished. The tightness and soreness has eased up. It’s been hard to not exercise or run at all but I know my body and especially my legs need the rest. I want to be able to train better for the next big race which is likely to be next May with some smaller races in between. I can’t begin to thank those of you in the infertility community for your amazing support. On Twitter I thanked you all and told you that I love you all but I really do mean it. There is more to life than having children and when we support each other and celebrate non child related accomplishments it shows the world that we are there for each other always. It is truly humbling to receive the support I have. I am forever grateful to have connected with you all and don’t believe I could ever repay the kindness you have shown me. I know this post isn’t really infertility related and posting it on this blog may seem out of place. The reason I am writing this post is that I think it’s important for those going through the journey to realize there is more to life than having kids. Though those other things in life do not replace the loss of the ability to have kids. The hurt is still there. The empty bedroom still exists in my house. The holidays will still be childless this year and likely the remainder of our lives. But my running has regained some of the self confidence and belief in myself that I lost with my infertile diagnosis. I believe in myself again and my ability to work through adversity and accomplish things that seem impossible. While I don’t think that becoming a distance runner is something every infertile couple should do, I believe that we all need to find something in our life to work towards that doesn’t involve having children. It will help those who never become parents to get through the rest of their lives. This entry was posted in Childless, Infertility and tagged Childless, Infertility, Running on November 7, 2014 by gsmwc02. Recently (actually 2 months ago) I wrote about how I have unexpectedly gotten back into running having run a 10K on the 4th of July. I spoke of the possibility of attempting to run a half marathon. For those of you who follow me on twitter you know that possibility is now a reality. 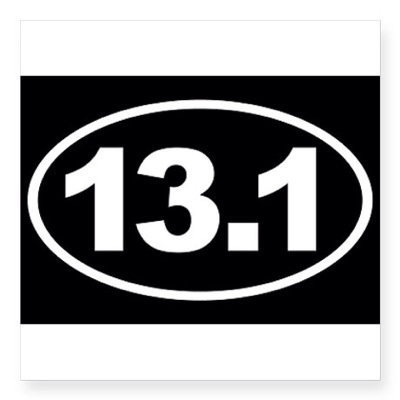 I have registered to run a half marathon on a week from this Sunday (November 2nd). For the first time since my infertility diagnosis it’s something I am looking forward to and have been working towards with maximum effort. There are a lot of people in the infertility community who run distance races or have run them in the wake of infertility or prior. In a lot of ways distance running and training for distance races are like the infertility journey. This piece I put together to go through the similarities and how running and training for distance races can apply some of the concepts to infertility journeys. A runner needs to have a similar mind set and approach that an infertile couple has in addition to having a training plan and be willing to be flexible with that plan as things will never go as planned. When I set out in late July to train for the half marathon I developed a training program that included three days where I would run with one day being a speed workout (track), the second being shorter quicker pace run and the third being a slower pace long distance run. In addition there would be two days a week where I would cross train meaning I would either bike, go to spin class or use the elliptical machine. Each week I would increase and vary the intensity of my workouts either in distance or pace. As the case with try to have kids couples set out with a plan that they map out when they will start trying. In both cases unexpected things come up that derail those plans. I had dealt with calf tightness in the spring time when I was getting back into shape, so I started to wear compression sleeves on both legs which helped. But three weeks into my half marathon training the calf tightness turned into Achilles tendinitis. The training plan I had mapped out now had to be adjusted. I had to take almost a week off from running, dial back my distance, drop the speed workouts for a few weeks, add more stretching to my routine and ice both ankles after each run. The other option I had was to pass on running the race and heal. It probably wouldn’t have been a bad decision but having registered for the race I felt I could manage it through the race and then could take time off after the race. Infertility takes a couples plan for having children and forces them to make adjustments and do things differently. Rather than having children the natural way couples either go through treatments or pursue adopting or decide to move forward ChildFree/Childless. For every couple that decision is different and there is no right or wrong answer. Running a distance race from a mental standpoint takes patience, discipline, focus and determination. As with a training plan for distance running, running the actual race deals a runner adversity and what they initially set out to do in terms of pacing will change. A runner may start out at too quick a pace and need to slow down in the middle of the race so they have enough energy to have a strong finish for that last mile. They may get a cramp that forces them to slow down at a certain point. Finally there is the runners wall that marathon runners talk about. The wall is a point in the race where you feel you have nothing left to give to that race. It can mentally destroy a runner’s confidence. But if a runner is able to break through that wall, it gives them a boost leading them to finish the race. The runner recognizes that the race is not a sprint but a marathon with peaks and valleys before crossing the finish line. Surviving infertility from a mental and emotional standpoint takes patience, discipline, focus, honesty with one self and the ability to be flexible. When I say surviving infertility I’m not so much referring to a baby being the end result as I am a couple not breaking down and falling a part as a couple and as individuals. It’s easy for a couple to want to rush to the baby being the end result rather than pacing themselves making the best educated decision based upon the circumstances. Runners are competitive people who like to compare themselves. They also talk to one another to see how each of them train and approach races. But the reality is not everyone is the same. Our bodies are all different. What works for one runner isn’t going to work for other runners. The shoes we wear will be different depending upon our arches, how we strike the ground with our foot and our stride. It’s important for a runner to recognize that they are unique and do what works for them recognizing their limitations. Infertile couples while not competitive athletes compare themselves to other couples. They compare themselves to people with children feeling inadequate that their bodies don’t operate the way others do. Those going through treatments compare themselves to people who were able to have successful treatments. Those in the infertility community also share experiences to learn from each other and apply it to how they go about their journeys. It’s important for infertile couples to recognize that everyone’s body is different and not everyone’s journey will end with a baby or child for that matter. There is no right or wrong answer it’s what works for that couple. Looking at K & I and where we are at in the infertility journey and using a running analogy almost two years after my diagnose we are at that runners wall not sure how to break through that wall. We started out with a nice pace slower than my liking but it’s a pace that’s worked for us and allowed us to work on things so we make the best decision possible that works for us. The last thing we want to do is rush to a decision and not have enough left to finish strong. After all the infertility journey is a marathon not a sprint. This entry was posted in Infertility and tagged Half Marathon, Infertility, Male Infertility, Running on October 24, 2014 by gsmwc02.